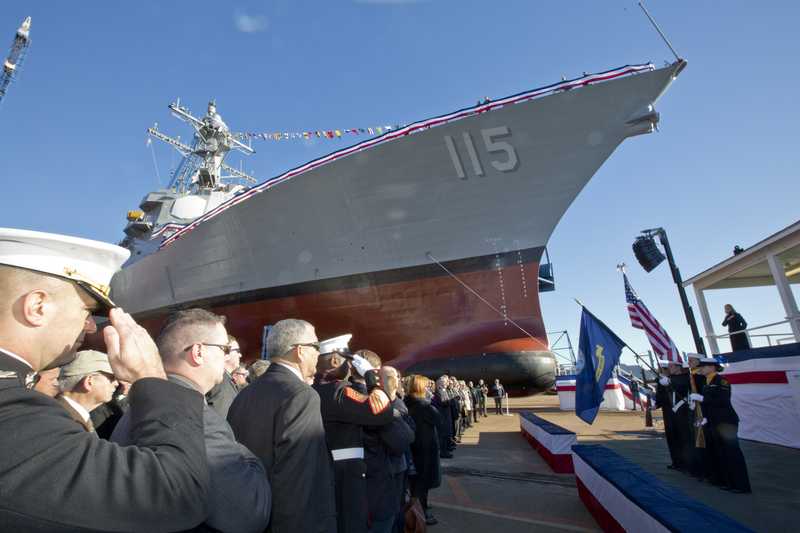 The first restart Arleigh Burke-class guided missile destroyer built by General Dynamics Bath Iron Works completed its first set of builder’s trials, Naval Sea Systems Command said on Wednesday. Rafael Peralta (DDG-115) conducted two days underway in off the coast of Maine to test the ship’s “operational capability of key communication, damage control, navigation and propulsion systems,” read the statement from NAVSEA. “Rafael Peralta is the first Arleigh Burke (DDG-51) destroyer that BIW has taken to sea since the program restarted in 2010,” said Capt. Casey Moton, DDG 51 class program manager, Program Executive Office (PEO) Ships said in the NAVSEA statement. The 9,200-ton destroyer is built around the Baseline 9 Aegis combat system that will allow the ship to simultaneously track ballistic missiles as well as traditional air warfare threats – like cruise missiles and aircraft. BIW’s Peralta’s and the under-construction Thomas Hudner (DDG-116) are part of the quartet of restart destroyers announced by then-Secretary of Defense Robert Gates in 2009 following the cancellation of the next generation cruiser program (CG(X)). Last month the first Huntington Ingalls Industries (HII) Burke – John Finn (DDG-113) – completed its Alpha trials in the Gulf of Mexico. The following is the complete Oct. 19, 2016 statement from Naval Sea Systems Command. BATH, Maine – The future USS Rafael Peralta (DDG 115) successfully completed alpha trials Oct. 18 after spending two days underway off the coast of Maine. The trials were conducted by shipbuilder General Dynamics’ Bath Iron Works (BIW). Alpha trials, the initial set of builder’s trials, is the first of three underway periods that the ship will conduct to test and demonstrate that the ship’s systems are properly installed and operational. RafaelPeralta successfully conducted a series of test events to demonstrate the operational capability of key communication, damage control, navigation and propulsion systems. Rafael Peralta is equipped with the Aegis Baseline 9 Combat System which includes an Integrated Air and Missile Defense (IAMD) capability incorporating Ballistic Missile Defense 5.0 Capability Upgrade and Naval Integrated Fire Control-Counter Air. The ship’s IAMD radar will provide increased computing power and radar upgrades that improve detection and reaction capabilities against modern air warfare threats. The Aegis Combat System will enable the ship to link radars with other ships and aircraft to provide a composite picture of the battlespace and effectively increase the theater space. DDG 115 is the 65th Arleigh Burke (DDG 51) class destroyer and the first of the DDG 51 Flight IIA restart ships to be built at BIW. The shipyard is currently in production on future destroyers Thomas Hudner (DDG 116), Daniel Inouye (DDG 118) and Carl M. Levin (DDG 120) and under contract for three additional ships awarded as part of the five-ship multi-year procurement for fiscal years 2013-2017.